How to file your taxes online using the Income Tax India website? Vikrant commented on the Perfios post last Friday on how easy it was to register and file taxes on the Income Tax India website if you have income from only one source viz. salary, and that it took him only 10 minutes to file his own taxes this way. I’m not familiar with this process, so I asked him if he would share his experience and he replied very promptly with the steps involved in this process. Here are the instructions that he gave me (slightly edited). Itâ€™s very simple, especially for people like me who have only one source of income which is salary income. 2.Â You need to register first, and that’s done by clicking on the Register link that’s present on the right side of the screen, and supplying your PAN. 3.Â Once registered, enter your PAN number and password to login. 4.Â Â After you login, you will find a page where you can choose to file return for this year or previous year, Letâ€™s take an example of this year. When you point your mouse to E-Filing A.Y.2012-13 it would prompt: “Individual, HUF” as shown below. Click on the “Individual, HUF” link. 5. The next page has a set of instructions on which form you should use for your tax filing. These are fairly detailed instructions, and you can easily make out which form you should use based on the details given there. Here is a screenshot of the instructions. If you look at this page, it will tell you what which ITR form you need to use. Based on the kind of income you have, you will need to use the respective form like ITR1 , ITR2 and so on. As I said, I will use ITR 1 as example as I come under Income from Salary/Pension . 6.Â Click on the Excel Utility (Version 1.0) for ITR 1 and similarly for other ITR whichever is applicable to you. 7.Â Fill this form based on the information present in form 16 and validate that. 8.Â Once you have filled the form (there are 4 pages you need to fill; all those which are applicable). Click on validate and then click on Generate. This will generate a XML file which would be saved automatically in the same location where you had saved the excel file that you downloaded. 9.Â Once the XML is generated, all you need to do is, click on the > Select assessment year on the left hand side of the web page and select the year assessment year, which would be AY12-13 for this year. 10.Once you click on AY 12 â€“ 13 Â you will find this page. 11.Once you click next you will find another page that looks like this. Click on Choose file and select the XML fileÂ that got saved when you generated the XML. And click upload. 12. You will get an email from income tax office that will have a PDF file called ITRV. Take a print out, sign on the form and send it to the address mentioned on the file by ordinary post or speed post. It’s all done! It’s a very simple process if you have income from only one source. Vikrant’s instructions are fairly detailed and it looks like a simple process by the looks of it. Many thanks to him for sharing these with everyone here! Has anyone else tried this and if so what is your experience? Last yr we used this facility to file returns online. Its in fact cumbersome for one who is not much conversant with computer and internet. http://www.saving-ideas.com/2011/07/file-i-t-returns-online………though it do not carry any screenshots like above…may find useful. Thanks Paresh, you had a single source of income also or were you using some other form? I wonder if it becomes more difficult if you have more than one source of income. Its difficult in the sense that as there is no way to confirm that we are doing it in right direction….I am not CA or like this and it takes us more than 3-4 hours to understand the process at that time. If you have other sources of income then additional steps arises like to enter TDS details,add income from other sources , calculate tax liability and if there is additional tax liability then pay it through tin-nsdl website..
For first time its difficult to understand the overall process. Thanks for that info Paresh. Manshu – How can I contact you? Pls. send me your eamil. I have some queries. Thanks. Please leave an email and I’ll answer it here. Unfortunately, due to the heavy volume of email I get, most of them go unanswered. I am using the above facility for filing ITR 2 & ITR 4 for last 2 years. The process is quiet simple. Only thing is if you upload the xml file in last 2/3 days of july it takes time. Thanks Salil, it takes time in July because of traffic? Since the last date is in June I would’ve thought it took more time to do it in June near the deadline. No Manshu, the last date of filing I-T returns is July 31st each year and not June 30th. My mistake Shiv – thanks for pointing it out. Hi Manshu… I used the site myself for FY 2010-11 (AY 2011-12) when I left my job & started on my own. I filed my own I-T return and returns of my family members and many of my clients with a little assistance from my associated CAs. I found the site quite user friendly and easy to work on, given you know some basics of filing returns, taxation laws and doing these kind of stuffs online. Personally, I had incomes from all the sources except income from house property i.e. salary income (for 7 months), business income (for 5 months), income from other sources & income from capital gains (shares, mutual funds etc.). I think the biggest benefit of filing your returns online is that you cannot go wrong on many of the important aspects of filing a return as many of the sections in the return are internally connected to each other. If you fill some info at one place & it differs with your input at some other place, it automatically informs you accordingly and stops you from proceeding any further. So, that ways you cannot go technically wrong in filing your return but you are still exposed to missing out on feeding some data though unintentionally. There are many other benefits of filing I-T returns online like it is secured, paperless, ensures faster refunds, minimal chances of losing any of your documents, you can file from anywhere & anytime and many others. There is a scope of improvement also on many fronts but still it is quite easy to do it. Thanks for sharing your experience Shiv. Based on what I’ve read so far it looks like everyone should try this at least once to see if they can figure it out or not. Most likely they will, and if they don’t then there’s no harm done anyway. A very useful article with step by step procedure, with images. For those who understand how to file the income tax returns this is a very helpful. Filling ITR -1 form is easy for it maps mostly to Form 16 provided by the employer. But one should understand the process. I have seen people getting confused over Financial Year and Assessment Year and have filed ITR return for wrong year. Often companies have CA’s coming coming over in month of July to do income tax return filing and they charge nonimal fee 100Rs to 200Rs for ITR-1. Other than official website there are websites such as taxspanner.com, taxshax.com, taxsmile.com and taxsum.com. The non-government websites differ from each other on two counts, the number of income sources they cover and the process involved. They also have different packages, offers and discounts. The user-interface of these websites is simple and prompts you to fill up a slot you have missed or ask you to rectify a mistake. Have describe the income tax process in my article Income Tax Overview which might be of help to readers! Thanks for sharing your link BMA. I really hate the concept of financial year, previous year and assessment year….I don’t think having a financial year that ends in march does any help at all. Would you know why this is kept this way? It is a lot simpler to just have the financial year and calendar year close in December. The Indian Constitution had empowered only the central government to levy and collect income-tax. The Income-Tax Act was enacted in 1961. The Act came into force from April 1, 1962 and that’s why our financial year begins on April 1 every year. The reason for starting the Financial year from 1st April is just a legacy we carried from Britishers like many other things which was not necessarily suited for India. This Financial year is followed around in many other countries so the passing of IT law is the effect rather than cause. Nice post, and also at the right time. I have been filing my IT returns through this mode for the past 2 years. It is quite an easy way to file returns, and the speed of getting refund is super quick. However, being a CA, the tax concepts are easy for me. However, the same might pose challenge for people not related to this field. Hence, in case one is not clear on tax treatment of certain things, better to consult a CA/ professional. Thanks for sharing your link Abhinav. Totally agree with you Abhinav and commend your effort in helping out others. I also applaud your courage about publicly declaring that you are CA and made careless mistake. We all make mistakes and should learn from them. Now because of that mistake you learnt and all of us are learning too! As far as being a CA is concerned well there is lot of difference between theory and practical. If it is some solace to you I know a guy from IIT with ability to solve the most difficult puzzles and when he filed his returns first time, he filed for wrong assessment year. His case came up for scrutiny and he is running around to get it rectified. (there are some mismatch of Form16 and Form 26AS involved but that’s a different story.) Since then he collects all information , fills the ITR form himself but then asks CA to cross-check and submit it for him and pays CA 1000 bucks for it. I have used the site for past two years and found it pretty simple to use. One point to note is that if one has IT refunds then its best to file returns by May end – in most cases the refund gets credited before July end (the deadline to file returns)! Wow..didn’t know about that but some companies haven’t given Form 16 itself and it’s mid Jun. I am quite fond of it.I have been using it almost for the five years now.I am techie and tech enthusiast so I want to do all my things online from small things like mobile recharge to purchase electronics mobiles to online reading to online learning languages and to filing taxes online to booking travel(air,bus,rail) and hotels online.Income tax return efiling is one of the best websites from the govt sector.Other great services are passport and pancard.And now I try to do most of these things using my smartphone.The process still gets easier. I have been using this site for 3-4 years now with no problem. But this year am in a spot with regard to few point’s which will need professional help. Will be glad if you or your readers can point me to some professional who can help me solve these queries. 1. I left in India in the end of June 2011 and was there for 3 weeks in Jan’12, so i believe i’ll be considered a resident (staying more than 90 days) for tax purpose for this year. Need someone to confirm. 2. My employer has given me the Form 16, but he hasn’t considered the home loan exemption for calculations. I now want to take that into account. What’s the right way to do it ? 3. I have some short term and long term profit from sale of my ex employer shares (SAP). since these are not traded in India, how to go about the capital gains filing for them. 4. I also have some short term loss from trading in Indian shares. Can this loss be offset against my short term gain from shares in mentioned in point 3 ? i had filed return for the year 2011-12 online. now i need a generated xml file for the year 2011-12. how i obtain ? can i get fron income tax website? how? Very useful information. The details are very useful and easy for first timers. If the person filing tax do not have a last name, what needs to be filled in the xls? Last name is mandatory field. Hi Lavanya… fill your first name in the “Last Name” box and leave the “First Name” box blank. Hi Shiva… Thank you very much. That worked :). Hello everyone, I am looking for some advice with respect to filling the ITR-1 form. Basically, my Taxable Income is actually lesser than the one shown in Form 16 due to the HRA exemption that I could not claim in time. So when I fill the form now with actual details, there is a difference in Sheet 1 (Income Details) & Sheet 2 (TDS) where the Income appears. Due to this difference, I am unable to generate the XML file. Please advice. I think you could try placing the extra amount under the advanced tax section below and qoute the correct details from the segment mentioning the details of tax deposited in your Form 16. If asked then you would have to explain it to the AO. Alternately there might be other better ways. So reach out to a CA first or a TRP for help. ok so did some google search and it seems you might need to update the tax status to tax refundable. I am facing exactly the same problem now! 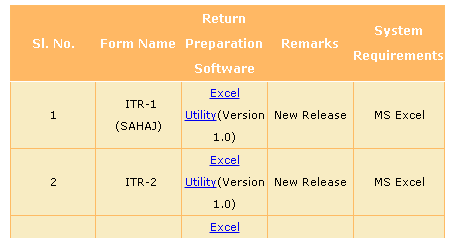 I am looking for some help on filling up the ITR1 (SAHAJ) Excel utility downloaded from the efiling website. I have some deduction under Sec 80G to be claimed (this is present in the Form 16 issued by my employer). However the cell against Sec 80G is not editable in the downloaded Excel. Can someone please guide me on this? I checked the Excel utility for the last Assessment Year and the particular cell against Sec 80G was editable, no idea why it it not editable this year! Just figured it out ! Thanks for sharing that info here Hari! IT department has done a great service by launching e-filing of IT returns. 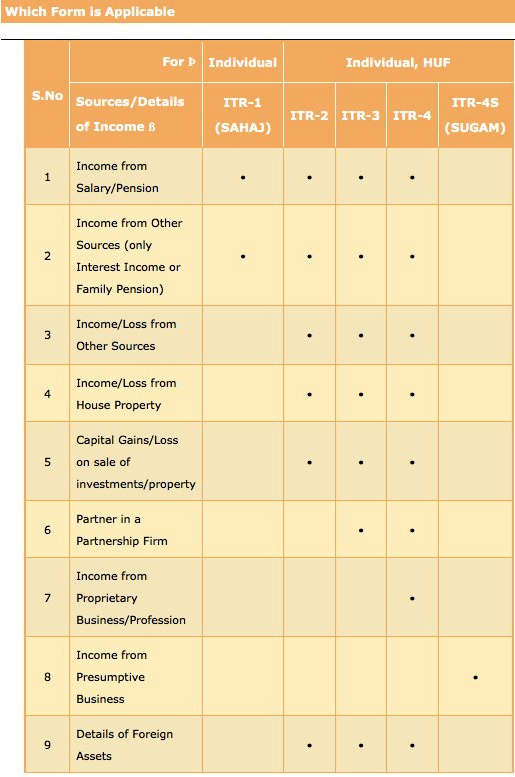 This year’s form selection table on the e-filing site (screen shot shown in the article above) has a small mistake: for income or loss from one house, one can use ITR-1 but the table shows that one can not use ITR-1. Due to this misleading table, some of my friends ended up downloading ITR-2 and struggled with more detailed work, though they could have used ITR-1 simply. 2. I have received following amount . Are these taxable ? c. Redemption amount of HDFC top 200 and Reliance equity (1 year completed) . 3. How do i file my father’s return online ? which Itr to select ? He is 63 yrs old. He owns a shop but he is retired and gets an annual rent of 144000. No other income. My problem is different. Problem is not on submitting online. Problem is converting excel file to XML file. I have MS Excel 2007. I have filled up every information in the excel file. But I could not convert excel file to XML data file. I tried to rectify the problem by downloading some items in the internet. But nothing is solved. Is there any free online site where I can convert 4 pages excel into one XML data file??? Hope it helps the readers!